Those of you who know about the philosophy of Ginobility also know that we are permanently searching for outstanding and interessting products within the Gin universe. While nearly every day new Gins pop up anywhere over the whole globe this task becomes not easier! For sure not! Identifying products where the whole package fits, starting from the first visual impression, the story behind it and last but for sure not least the taste becomes really challenging these days. One of these perfect matches is Greyling Modern Dry Gin of the Distillery with the interessting name "Two Birds Artisan Spirits" from Michigan, USA. Stumbeling over this outstanding product the first time on Pinterest searching for nice pins to repin on our board, we had the clear feeling that this must be something special. After getting in touch with Nate and Ryan via Facebook the very first time, they did let uns know that they were searching for ways to get their Gin to Europe. Destiny?! 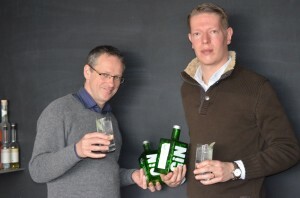 So after we have had the chance to taste this nice Gin things finally got rolling: we did our homework, Nate and Ryan did theirs and now we are proud to exclusively present Greyling Modern Dry Gin to Germany and the rest of the "old world". But who are these guys from Michigan? What is it about this strange name Greyling? And what is a Modern Dry Gin? The following intereview with both Greyling Masterminds and owners of "Two Birds Artisan Spirits" Ryan Bailey und Nathan Jonjevic hopefully clarifies things and provides Germany and Europe with a clearer picture of Greyling Gin and why Ginobility brought it to Europe. If not, feel free to ask us any time! But for now...have fun reading! 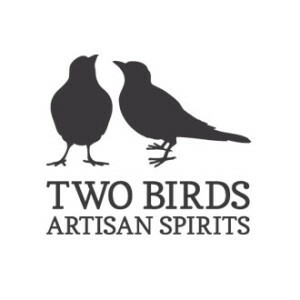 What is your company Two Birds Artisan Spirits about? Where are you located? Do you have a special kind of philosophy that your company and products are based on? Nathan: Greyling is not totally new to Germany. We’ve got a few friends in Aachen that are big Greyling fans! Aachen has a growing craft cocktail scene. Ryan: Two Birds started as a bit of a lark. Nate and I tried other craft spirits and thought that it might be an interesting experiment to see if we could make a business of making our own. Nathan: We wanted to start by making the gin that we want to drink, to see if our perspective would be appealing to other drinkers. Now we’re committed to building a company around the production of this gin and future products. We intend to stay small so that at no point is quality sacrificed. Ginobility: Nathan and Ryan, you are the founders of Two Birds Artisan Spirits. Are you the “Two Birds”? And if so, why did you pick this name? Nathan: When I first started thinking about starting this company, I thought a lot about the example I want to set for my two daughters Lola and Felan. I want to show them, through my work, that they can try to do whatever they want, whatever makes them happy, and that it is okay to take calculated risks. My girls were a big inspiration. The word bird is an old English slang term for girl, so as it happens I have two birds. Now, though, it’s fun to think of ourselves, Ryan and me, as the two birds. Ginobility: Let’s chat about you two before we talk about your gin. What are your roles within the company and when did you decide to build up a distillery and produce your own spirits? Nathan: It’s interesting. When you start a project like this, it’s easy to have grand notions of making nice things for people to enjoy. 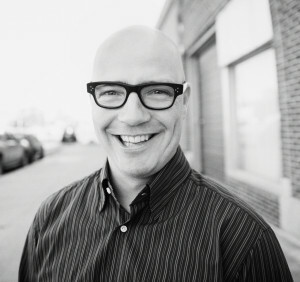 The reality, though, is that we’ve morphed from makers to marketers. It’s basic. You can’t make what you want until you have a market that’s suitably large and capable of being sufficiently supportive. Ryan: It’s important to note that we don’t have a distillery yet. We’re distillers without a distillery. We like to think of ourselves as Gypsy distillers. Nathan: The idea of Gypsy brewers has been around for some time in the beer making community. We adapted the idea to spirits making. In the U.S. it’s difficult, complicated, and expensive to set up a distillery, even a small one. We wanted to get to work right away; this model allowed us to develop a product and get it to market inside of a year. 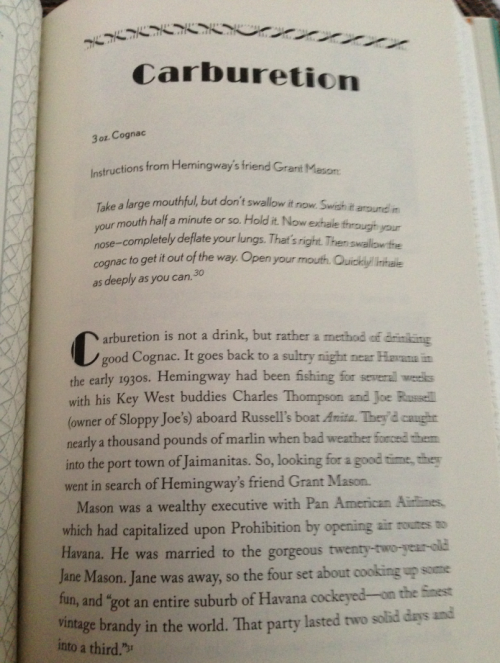 Ryan: Now that Greyling has a following, a distillery seems to be one of the next logical steps. There’s no need for us to rush. Ginobility: We are in the middle of a Gin Boom in Germany. We have heard from so many small distilleries in the US for some time now. Is gin such a big thing in the US as well as it is in Europe? Ryan: Right now, gin is still really being rediscovered in the US. Vodka took over as the main cocktail spirit in the 1960s when supplies of relatively inexpensive Russian vodka became available. Gin is gaining in popularity and slowly reclaiming its rightful place as the primary cocktail spirit. There is still plenty of room for growth, however. Ginobility: Let’s talk about your first product Greyling Modern Dry Gin that is a handcrafted small batch gin. We are sure that there are many things to tell us about. So let’s start with the name Greyling and the story behind it. Nathan: The greyling is a small, silvery trout like fish that populated waters in the northern Midwest and Great Lakes Region (where Ryan and I are from) until the early 1930s when they went extinct. They were totally killed off by over fishing and by the lumber industry. The rivers and streams where they spawned became clouded with silt created by logging. They greyling met their demise at approximately the same time that small scale distilling died off in the US because of Prohibition. Our marketing story is that we are bringing the grayling back as a crisp, clean, craft gin. Ginobility: Greyling is based on spirit that incorporates Michigan Hard Red Winter Wheat. What is special about this kind of wheat and is there anything about the production process, which makes it even more special? Ryan: We start with wheat for two reasons. Practically, wheat makes a very neutral spirit. For our gin it acts as a blank canvas. It doesn’t influence the botanicals – they are able to stand individually. Plus, grain is a significant portion of Midwestern agriculture. It seemed an appropriate foundation for a regionally sourced gin like Greyling. Ginobility: Greyling is based on 5 botanicals only. In Europe there are many Gins coming up with more than 10, 20 even 70 botanicals. So Greyling seem to focus more on the roots of Gin and concentrates on a kind of simplicity. Is this part of the concept? Nathan: Simplicity is absolutely part of the concept. A customer of ours said it well. He complimented Greyling, calling it an exercise in restraint. Greyling is a sort of revisionist take on gin. We use only what’s necessary for balance, sweetness, and aroma. Too many botanicals and gin can seem overworked and taste a bit muddy. Ginobility: You use Juniper, Coriander seeds, Grapefruit and Orange peel and Lavender. What is special about these botanicals and what qualifies them to be used for making a Gin as nice as Greyling? 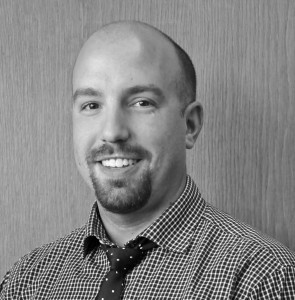 Ryan: Our choice of botanicals makes mistakes in the distilling process difficult to hide. It’s an honest recipe. Each botanical works nicely when used in the proper amount. Too much, or too little, of any of the botanicals would make for a completely different gin. Nathan: We’re proud of the combination. When we started developing Greyling, we considered using a few more botanicals, but as things progressed it became evident that for this gin, the pared down list worked. The lavender is sort of our tour de force. This variety of lavender is specially grown, culinary grade lavender form northern Michigan. It contains no camphor, like perfume grade lavenders, which can impart a bitter taste when incorporated into food and beverages. Ginobility: How would you describe the taste of Greyling Modern Dry Gin to our readers and what makes it a “modern dry gin”? 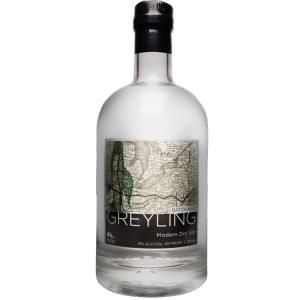 Nathan: Greyling is neither a fully traditional London dry gin nor a totally contemporary or New Western dry gin. It’s somewhere in between. At the onset the recipe is fairly traditional, however the use lavender to offset the juniper and citrus, and to give the mix balance and a hint of sweetness, is a more modern, American approach. Ginobility: What kind of still are you working with? Are there any specials used for the production of Greyling Gin e.g. infusion, steam infusion, digestion etc.? Ryan: You’ll be happy to know that our American gin is made in a German still. Greyling is distilled in a 90 gallon Christian Carl pot still. The essence of the botanicals is removed using vapour extraction. Ginobility: As already mentioned Greyling Modern Dry Gin is your first product. Are you already working on other products? Maybe a follow up version of Greyling? 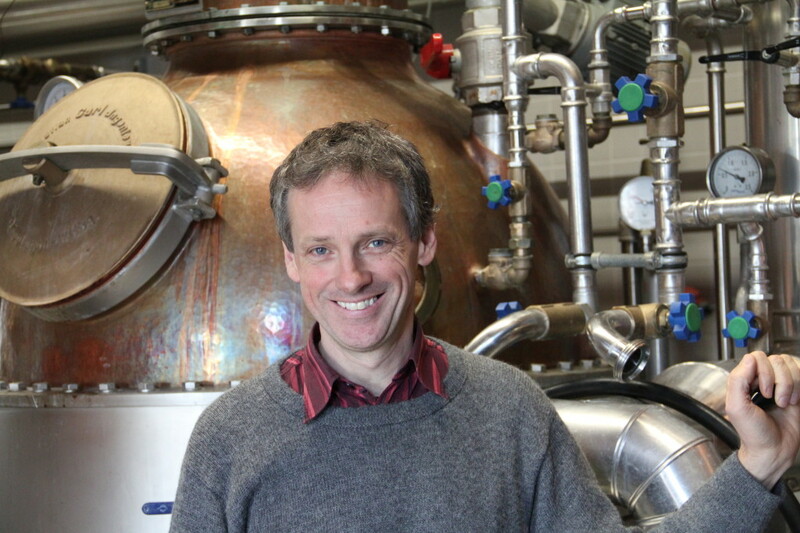 Ryan: We’re seriously considering making a big, complex gin, one where the production process is a bit more involved. But right now, Greyling is keeping us extremely busy. Nathan: Shortly we’ll be experimenting a bit with making our own tonic, one that combines well with Greyling. It’s difficult to say now how that will go. Ginobility: Gin & Tonic is the most favourite gin based drink worldwide (together with maybe Dry Martini). Greyling for sure works fine for both and beyond. Do you have any recommendation regarding recipes that work best with Greyling? 1.5 oz Greyling Modern Dry Gin, .75 oz fresh-squeezed lemon juice, .5 oz simple syrup. 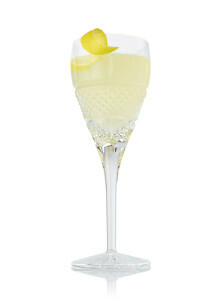 2 oz Dry Sparkling Wine (brut champagne or cava), Lemon. In a cocktail shaker combine gin, lemon juice, and simple syrup with ice. Shake well. Strain into glass. Top with sparkling wine. Garnish with a lemon twist. Nathan: You’ll have to trust the guys at Ginobility. Clearly, they know good gin! 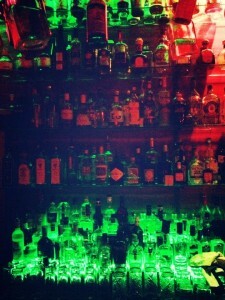 Prost!! 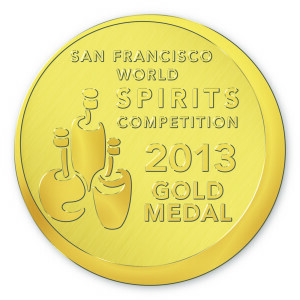 Follow the guys from Two Birds Artisan Spirits on Facebook and Twitter or visit their website. 18. März 2014 / Gin, Interviews / by ginobility. Lorenz Humbel vor seinem "Zauberkasten"
Ginobility: Sie brennen nun bereits in dritter Generation hochwertige Spirituosen. Stand es für Sie je zur Debatte, einen anderen Beruf zu ergreifen und nicht in die Familientradition einzusteigen? Lorenz Humbel: Mich hat die Schnapsbrennerei schon gereizt, aber ich hätte auch etwas anderes machen können. Mit 22 Jahren – als ich gerade für länger in Italien weilte – wollten meine Eltern wissen, ob einer von den Kindern die Brennerei übernehmen möchte. Da meine beiden älteren Geschwister das Angebot ablehnten, habe ich zugesagt, weil ich nicht wollte, dass die Brennerei verkauft wird. Ich habe mir noch 3 „Wanderjahre“ ausbedungen und dann mit 25 Jahren die Brennerei und die Geschäftsführung übernommen. 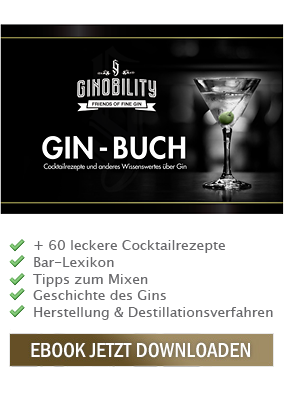 Ginobility: Seit wann haben Sie Gin in Ihrem Repertoire und wie kam es zu dem Entschluss, Ihre Produktpalette um Gin zu erweitern? Lorenz Humbel: Wir haben 1995 mit Brennen von Bio Kirschen begonnen. Laufend haben wir unser Sortiment mit Bio Spirituosen erweitert. Ein paar Jahre später auch mit einem Bio Gin. Ginobility: Sie stellen den White Socks und den Clouds Gin her. Wo liegen die Unterschiede zwischen den beiden (geschmacklich, in der Zusammenstellung der Zutaten oder bei der Herstellung)? Lorenz Humbel: Der „White Socks“ ist aus dem Bio Gin entstanden, die Rezeptur wurde aber belassen. Wir hatten diverse Gins und Tonics auf dem Markt eingekauft und machten mit unseren Probedestillate versuche. Relativ schnell wurde klar dass die Zitronenschale den Wacholder für den Gin Tonic am besten unterstützt. Der White Socks ist straight - einfach und klar – auch heute noch. Der Glouds Gin ist eine Zusammenarbeit mit Andreas Kloke, Barmanager von der Clouds Bar in Zürich. Er ist mit seiner eigenen Rezept-Idee auf uns zugekommen. Der Clouds ist ein harmonisch und aromatisch sehr ausgewogener Gin, das trinkt sich locker auch pur! Ginobility: Als Sie den Clouds Gin zusammen mit Barchef Andreas Kloke für die Clouds Bar entwickelten, wie lief da diese Zusammenarbeit rein praktisch ab? Haben Sie gemeinsam geschnuppert und probiert oder lief es eher über eine „Fernbeziehung“? Lorenz Humbel: Unsere Brennerei ist gut 25 km von der City von Zürich entfernt und deshalb war und ist es keine Fernbeziehung. Rezeptur und die geschmackliche Vorgabe kamen von Andreas Kloke. Wir haben das Brenner-Knowhow beigesteuert. Geschnuppert hatten wir ein paarmal zusammen in Stetten und Andreas Kloke hat mit den Mustern auch in seiner Bar experimentiert. Ginobility: Sind Sie mit bestimmten geschmacklichen Vorgaben oder Vorstellungen an die Entwicklung des Clouds herangegangen oder haben Sie sich gesagt: Schauen wir einfach einmal, was so beim Experimentieren herauskommt? Lorenz Humbel: Andreas Kloke ist mit einer klaren Vorstellung auf uns zugekommen: Neben Wacholderbeeren soll noch Koriander, Thymian, Salbei, Zitronen und Orangenschale mit in den Gin. Wir stellten an die Zusammenarbeit mit ihm nur eine Bedingung: Als leidenschaftliche Kirschbrenner sollte es im Clouds auch etwas Kirsch haben. Seit Jahren „predigen“ wir, dass selbst homöopathische Dosen Kirsch ein Dessert verfeinern. Und dies trifft ebenso auf den Clouds Gin mit seinen intensiven Kräuteraromen zu. Ehrlich: Die nicht ernst gemeinte Bedingung hat zu einem Resultat geführt, das auch uns verblüfft. Ginobility: Verraten Sie uns doch noch etwas über die Herstellung des Clouds Gin: Werden die Botanicals gemeinsam verarbeitet und woraus brennen Sie den Neutralalkohol als Grundlage? Lorenz Humbel: Die Botanicals werden nicht alle zusammen als Gemisch in den Brennhafen gegeben, sondern wir stellen einzelne Destillate her, die erst nach der Degustation gemischt werden. Der Neutralalkohol ist ein Kornbrand. Alle Zutaten sind Bio. Ginobility: Stichwort Bio – Neben Fair Trade Produkten findet man bei Humbel ja sehr viele Bio-Produkte. Was bedeutet Ihnen diese Zertifizierung, warum legen Sie soviel Wert darauf? Lorenz Humbel: Ich bin selber schon lange ein überzeugter Bio Konsument und nach bald 20 Jahren Bio Schnapsbrenner Erfahrung darf ich so viel verraten, dass generell nachhaltig und extensiv angebaute Rohstoffe meist besser im Geschmack sind. Gerade in der Destillation, wo wir eine schöne Farbe, optimale Größe, knackigen Biss und gute Lagerfähigkeit nicht ins Destillat hineinbringen, sind die inneren Werte der Rohstoffe entscheidend. Ginobility: Wie sehen Sie die Zukunft von Bio-Produkten? Ist der Verkauf nicht beispielsweise durch enge EU-Vorschriften stark behindert? Lorenz Humbel: Der Markt für Bio-Produkte ist nach wie vor gut und bei den Destillaten sicher noch gut ausbaufähig. Was die Behinderung durch Vorschriften der Behörden anbelangt, kann man einen Brenner nicht beeindrucken, darin kennt er sich aus. Ginobility: Können wir uns denn vielleicht auf weitere/andere Gins aus dem Hause Humbel freuen? Lorenz Humbel: Zusammen mit Andreas Kloke vom Clouds ist dies schon noch möglich. Ginobility: Und was unsere Leser natürlich auch interessiert: Wie trinkt Lorenz Humbel seinen Clouds Gin denn am liebsten? Pur, mit Tonic, als Cocktail? Lorenz Humbel: Ich trinke am liebsten alles pur, so auch die Gins. Nur in der Clouds Bar, wenn Andreas Kloke hinter dem Tresen steht, kann ich einem Gin Tonic nicht widerstehen! Das können wir sehr gut verstehen und stoßen gerne im Geiste mit Ihnen an: Cheers, Herr Humbel und vielen Dank für das Interview! 11. März 2014 / Destillerien, Gin, Interviews / by ginobility. Sonntag Mittag, 23.2.2014, 13.30 Uhr in Frankfurt. Auf der Berger Straße in Bornheim ist wie gewohnt einiges los, Pärchen und Familien schlendern die bekannte Frankfurter Einkaufsstraße entlang, Cafés und Restaurants sind gut besucht. Ein ganz normaler Sonntag also! Auch ich bin einer der vielen Passanten, allerdings bin ich nicht auf dem Weg zum Mittagessen oder um mir ein spätes Frühstück einzuverleiben. Ich bin auf dem Weg in eine der Bars in Frankfurt die für eine exquisite und äußerst umfangreiche Auswahl an Gins sowie einen erstklassigen Bar-Chef bekannt ist – dass O-Ton. Hier findet heute ein kleines, aber feines Gin Tasting unter dem schönen Motto „Reise durch Schottland“ statt, welches wir auch promoten durften! Manch einer wird sich vielleicht denken dass halb zwei Uhr mittags eine etwas ungewöhnliche Uhrzeit für ein Gin Tasting ist. Bezüglich des Alkoholkonsums mag das sicher nicht ganz falsch sein, aber unter Tasting Gesichtspunkten hat es schon etwas für sich. Der Grund ist recht einfach: Um diese Zeit sind die Geschmacksknospen noch nicht so beansprucht wie das abends der Fall ist. Somit ist die Wahrnehmung der Aromen deutlich besser - gerade bei einer so variantenreichen Spirituose wie Gin es ist. 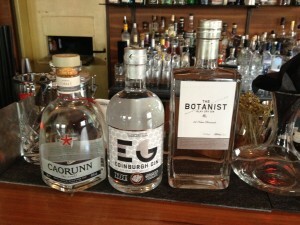 Caorunn Small Batch Gin, Edinburgh Gin und The Botanist Islay Dry Gin. Bevor es aber ans Tasten ging führte Antony die Teilnehmer zunächst in ein paar „Regeln“ ein. Zunächst einmal ist die Wahrnehmung von Aromen immer äußerst subjektiv und basiert immer auf Erfahrungswerten, Veranlagung und Wissen um die unterschiedlichen Aromen und wie diese alleine für sich genommen überhaupt schmecken bzw. riechen. Das die Hersteller immer die sogenannten „Tasting Notes“ mitgeben dient eher als grober Leitfaden und Orientierung. Abgesehen von theoretischen Tipps gab Antony auch Praktische zum Besten. 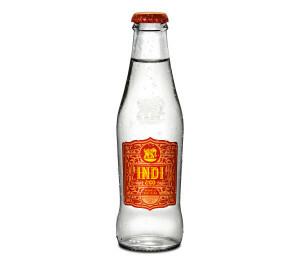 Zum Beispiel sollte man wenn man den Gin im Mund hat durch die Nase einatmen. Dies stellt die Aromen noch deutlicher heraus. Nach dem Schlucken kann man dann auch nochmals tief durch den Mund einatmen, was nochmals Aromen erkennen lässt. Diese Praxis war zum Beispiel bei Ernest Hemingway sehr beliebt der sie wiederum von seinem Freund Grant Mason gezeigt bekomme hat. Sie trägt den Namen Carburetion und die beiden haben diese Methode ursprünglich mit Cognac praktiziert. Anmerkung d. Redaktion: Man sollte es mit dem Einatmen nicht übertreiben, denn das kann je nach Produkt durchaus dazu führen, dass einem die Tränen in die Augen und der Alkohol bei entsprechenden Mengen überdurchschnittlich in den Kopf schießt! Daher die Ausdrückliche Bitte: DRINK RESPONSIBLE! Die Methode ist sowohl von Antony beim Tasting als auch von uns an dieser Stelle nur des gesteigerten Geschmacksempfindens wegen erwähnt!! Vor uns standen die für Tastings klassischen „Grappa Gläser“ die durch ihre „Kaminform“ die Aromen optimal nach oben ableiten. In diese Gläser wurde im ersten Schritt nur eine kleine Menge des jeweiligen Gins gegeben. Im zweiten Schritt schenkte unser Gastgeber einen deutlich größeren Schluck ein um zu verdeutlichen wie stark die Aromenwahrnehmung von der Probenmenge abhängt. Eigentlich logisch! Der erste der drei Gins war der Caorunn was auf gälisch, „Vogelbeere“ heißt und eines der für diesen Gin verwendeten hiesigen Botanicals darstellt. Welche Botanicals im einzelnen in Caorunn Gin zu finden sind könnt Ihr bei uns im Shop nachlesen. Der 150 Jahre alte Kupfer Still in dem Caorunn gebrannt wird heißt übrigens „Jenny“. Der 41,8% Vol. 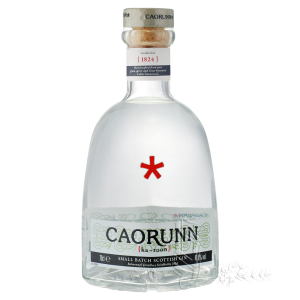 messende Caorunn Gin ist in der Nase sehr mild und kommt sehr fruchtig und leicht daher. Am Gaumen setzt sich die Frische fort, es gesellt sich aber eine angenehme Würze hinzu die mit der Fruchtigkeit sehr schön harmoniert. Es fällt aber auf, dass die Fruchtigkeit nicht wie so oft bei Gin zitronig sondern anders daherkommt. Das könnte an den verwendeten Äpfeln liegen ist aber nicht eindeutig raus zu schmecken. Wendet man nun das zuvor gelernte an und atmet nach dem Schlucken tief ein kommt noch ein leicht herber Eindruck hinzu der nicht nur vom Wacholder herrührt sondern wahrscheinlich von dem schottischen Heidekraut. Nach einem Schluck Wasser und einem Kräcker zur Geschmackneutralisierung ging es weiter zur nächsten Station unserer aromatischen Schottland Rundreise, nach Edinburgh bzw. 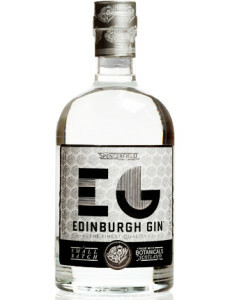 zum Edinburgh Gin. Auch seine Geschichte haben wir umfangreich in unserem Shop beschrieben. Der Kupferstill hat übrigens keinen ausgewiesenen Namen! Mit 43% Vol. ist dieser stärker als der Caorunn, Beim Nosing steht der Wacholder deutlich stärker im Vordergrund und harmoniert sehr schön mit fruchtigen aber auch würzigen Noten. Am Gaumen bleibt der Wacholder dominant, mischt sich aber mit einer leichten Süße sowie floralen Noten. Insgesamt kommt er deutlich kräftiger daher als sein Vorgänger was aber auch mit dem höheren Alkoholgehalt zusammenhängt. 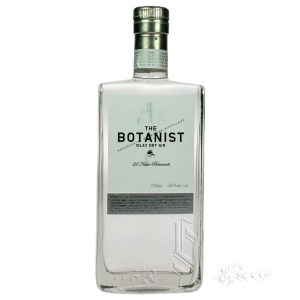 Last but not least landen wir bei The Botanist Islay Dry Gin aus der Traditionsdestille Bruichladdich. Mit 22 Botanicals führt er das Feld der drei getesteten Gins an. Gleiches gilt für den Alkoholgehalt von 46% Vol. Nur der Vollständigkeit halber: Der Kupfer Still in dem The Botanist gebrannt heißt „Ugly Betty“. Beim Nosing steht auch hier der Wacholder vornan. Insgesamt wirkt er sehr fruchtig aber auch würzig. Am Gaumen setzt sich auch wieder der Wacholder durch, die 21 verbleibenden Botanicals wirken sich zudem in einer sehr schönen und vielseitigen Komplexität aus.Weniger fruchtig, dafür aber mit lieblich malzigen Noten. An dieser Stelle merkte Antony nochmals an, dass die meisten Botanicals nicht verwendet werden um ihren charakteristischen Geschmack mit einzubringen sondern um in Kombination mit anderen Botanicals zu wirken und deren Aromen zu heben bzw. in neune Bereiche zu leiten. Nachdem wir dann alle wieder gut in Frankfurt auf der Berger Straße gelandet sind gab es zum krönenden Abschluss noch eine Kostprobe einer von Antonys Eigenkreationen. Ein Tanquarey Reserved Gin. In einem kleinen Eichenfass durfte Antonys Lieblingsgin 36 Tage lang die Aromen aus dem Holz aufnehmen. Das Ergebnis ist ein sanft roter ungemein milder Gin mit wunderbaren Eichen- und Vanillenoten, ohne aber den gradlinigen Tanqueray London Dry Gin Charakter zu verdrängen. Sehr fein!!! Und um das ganze noch zu toppen gab es für jeden noch einen Tanqueray Reserved Gin & INDI Tonic! Eine echte Offenbarung was Gin & Tonic angeht. Auch wenn das Tasting nur gute 2 Stunden gedauert hat, so kam es einem doch sehr viel länger vor, was absolut positiv zu werten ist. Der Rückweg über die Berger Straße war deutlich beschwingter als der Hinweg, soviel kann ich sagen. Woran das nur gelegen haben mag!? Vielen Dank an Antony für dieses wunderbar vorbereitete und lehrreiche Tasting! !